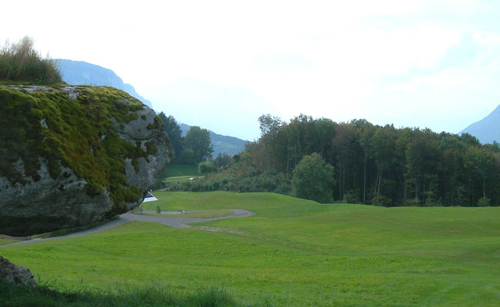 “Druid’s Stone”, which ist listed in the cantonal register as a protected heritage item and described in a range of publications. 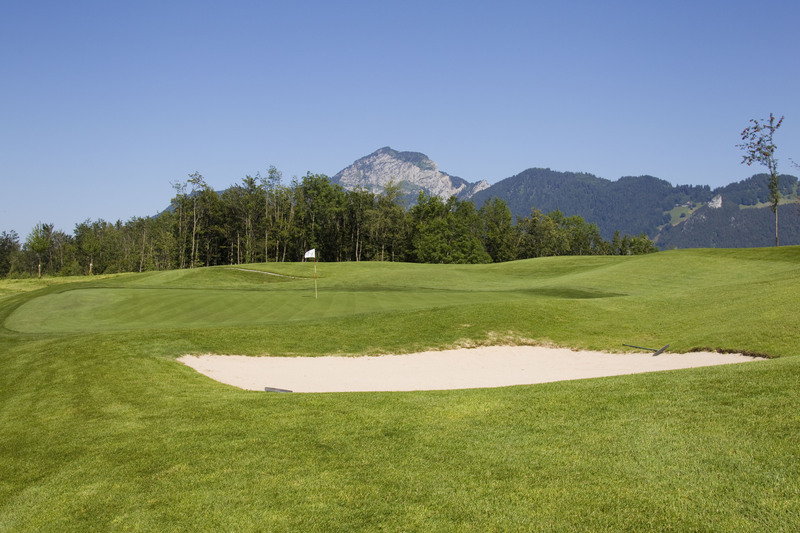 A short hole, where a good tee shot can leave you within putting range. The green is surrounded by imposing boulders that were deposited here some 15’000 years ago. Out of bounds to the right of the green. A short, difficult hole that can only be negotiated with an accurate tee shot onto the fairway. The flag is approached over a protected hazel hedge. 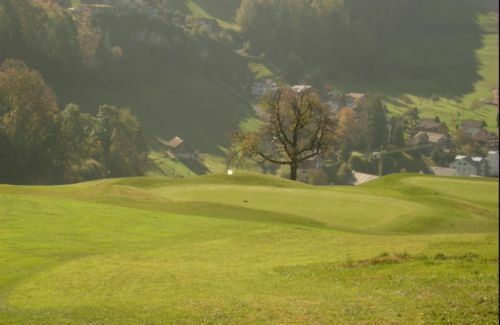 Long hitters aiming to reach the green in one shot will face multiple difficulties (trees, bushes, rough) to the left and right of the fairway and behind the green. The rather large green adds to the difficulties presented by this hole. A challenging hole with a large green that good players can easily reach in one shot from the tee. 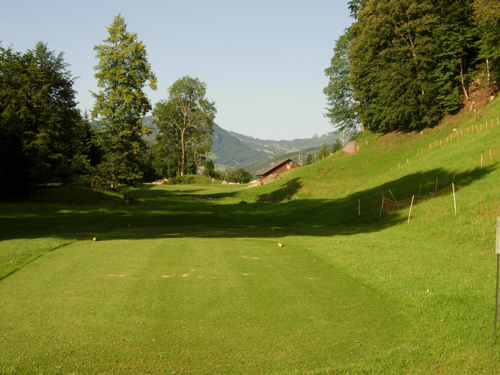 Several fairway areas are provided for less proficient golfers on the otherwise natural unspoilt terrain. In the background, the green is framed by a striking group of trees. 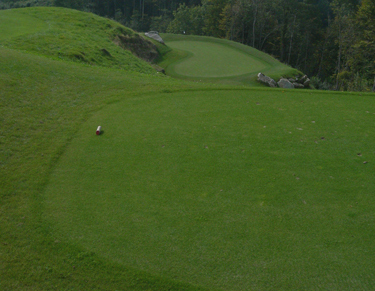 During green contruction, an interestingly layered rock was uncovered a fair distance to the right of the green. 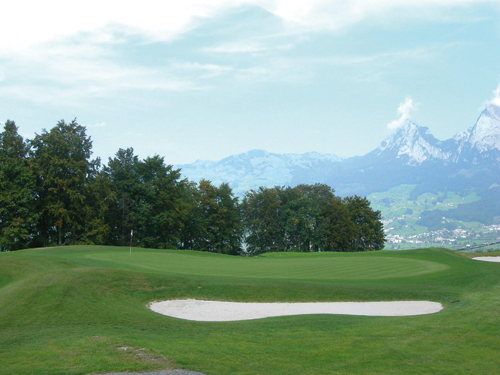 An ascent up old restored golfer pathways takes you to the teeing ground at hole 6. An extremely naturally undulating fairway that demands an accurate drive. To the right, there ist the threat of a steep drop with deep rough. To the left, the edge of the fairway is delineated by tress and hedges. a short dogleg to the left. The green makes use of an existing flat surface where a green used to be located in the past. A dogleg to the right with a generous fairway. 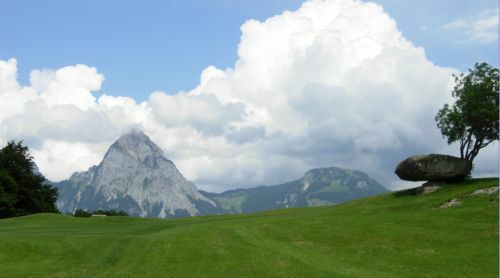 From the rear tee, a 130-metre drive over deep rough is required to reach the fairway. The green is framed by old and newly planted fruit trees that are part of a governmental project. the heavily undulatin green is protected by a front bunker. 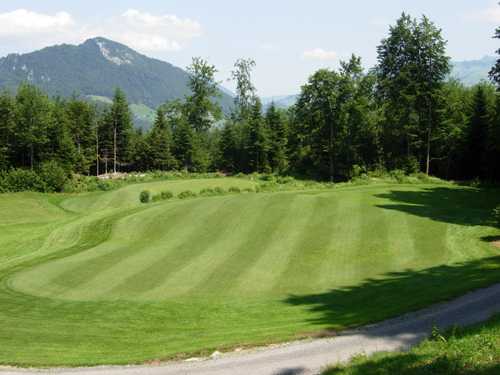 Uphill dogleg to the left wih a blind drive to a generous, natural unspoilt fairway. Long hitters are guided right onto the actual fairway by a newly planted group of trees to the left. A good tee shot and the heavily rooling, slightly elevated green can be reached from the second shot without great difficulty. Two greenside bunkers to the left an rights. A downhill hole of medium dificulty. The teeing ground opposite the “Druids Stone” is arranged on two levels. 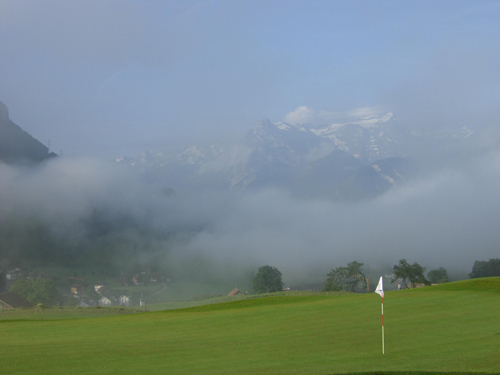 The two-layerd green demands a precise approach. The clearly visible pblic hiking path will not pose a problem. Hikers heve right of way (local rule). A long final hole in front of the clubhouse terrace, which is well protected against mishit shots by fences, hedges, trees and rough. The terrace grants a clear view of the interesting green, which is guaranteed to provide for the odd amusing incident.